May is National Bike Month! | Winners Drink Milk! Remember when you first learned to ride a bike – without training wheels? I still can recall the feelings of excitement, independence and great accomplishment. My brothers were even happy for me, because now they no longer needed to hold me up or push from behind. I could actually ride with them! (or so I thought). They were 6 and 8 years older than me, so they could go places I wasn’t allowed to go. And that’s just as well. It took me quite a bit of practice to be able to steer where I wanted to go (around the trees, not into them) and stop how (again, those trees) and when I needed to. 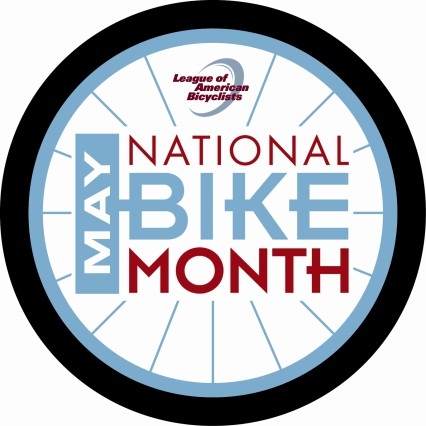 Did you know that May is National Bike Month? I wasn’t aware of it until I began writing this blog, and found a great website about it . Coming up from May 14 – 18 is Bike to Work Week, sponsored by the League of American Bicyclists. If you aren’t able to bike to work every day, Friday, May 18th is Bike to Work Day. And, today, May 9, is the inaugural Bike to School Day! While it’s too late to organize something for this year, check out the website to see all the resources offered so that you’re prepared for Bike to School Day 2013! So what’s so great about riding a bike? Isn’t that just for kids? It’s actually one activity that works for all ages! It’s a great way to fit exercise into your day. Plus you save wear and tear – not to mention gas – on your vehicle. And for some trips, it’s much faster. I remember having a bike when I went to college. I could ride it right from the dorm to class and take short cuts across the quad. And when I biked to athletic events, I was back home before many cars were out of the parking lot! If you’re looking for activities to do as a group or family, be sure to consider bike riding. One of my family’s favorite events is the NITE Ride, which generally occurs in June. In a nutshell, this is roughly a 25-mile bike ride through downtown Indianapolis that starts at 11:00 PM! A safe route is planned and streets are blocked off from vehicular traffic. It’s a family friendly event that is a ton of fun. Many cities host such rides; my husband and I have also ridden the streets of St. Louis during the dark of night. If you are intrigued, here’s where you can find out more about Indy’s late night adventure. Of course, bicycle safety is the number one concern, so be sure you know the Rules of the Road. So dust off the seat, pump up those tires, and enjoy the ride!